75th Birthday Ideas - 100+ Ideas for a Memorable 75th Birthday! What do you buy for someone who is 75? You’ll find loads of suggestions here! We’ve got everything from luxurious gifts to small trinkets – you’re sure to find a present that suits perfectly. Whether you’re shopping for a friend, your Mom or Dad, or your grandparents, you’ll find a present that they’re sure to appreciate and remember. A milestone birthday like this deserves a memorable party! Whether you’re planning an at-home event, a formal dinner and dance, or something in between, you’re sure to find unique ideas that are the perfect way to celebrate. Be sure to check out our helpful tips on planning a fabulous party. The perfect party starts with a fun and informative invitation! 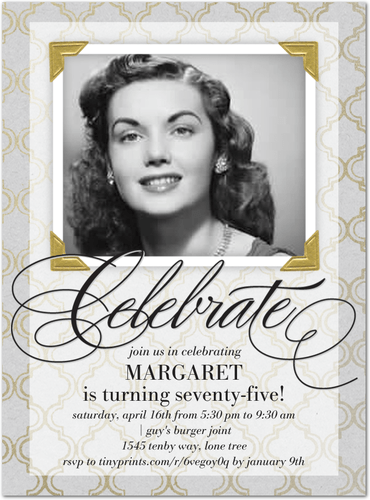 Set the tone for a blow-out celebration with one of these sure-to-please 75th birthday invites. We’ve got everything from photo invitations to colorful invites to formal occasion invitations – which can all be customized to suit your needs. 75th Birthday Ideas - 15 Fun Ways to Celebrate a 75th Birthday! This is the perfect time for a memorable birthday bash, with loads of pictures, decorations, cake, and good times. It can be as small as family only, or you cold throw an elaborate celebration with friends from throughout life. 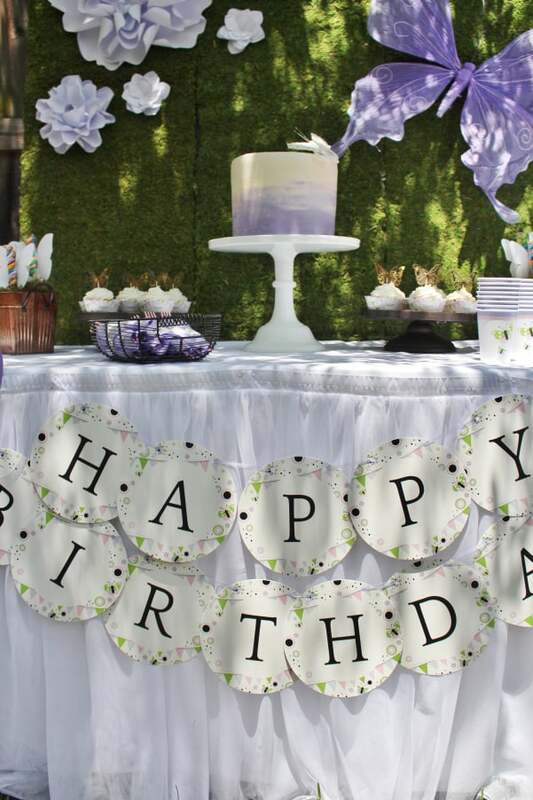 Get inspired with these fun party ideas. This is the perfect age to start checking off bucket list items...all those things they've dreamed of doing. At 75, they're probably still healthy enough for more physical activities, such as beach horseback riding or skydiving. Find out what your senior's bucket list items are, and make their big day memorable by fulfilling a long-dreamed of activity. This one takes a bit of coordinating and planning, but imagine how thrilled Mom, Dad, Grandma or Grandpa will be on their big day to open 75 cards from 75 different friends. Read the details on how to organize a message campaign here. Music has a special way of taking you back in time. Who doesn't remember their favorite songs from high school? Download some of the most popular songs from his or her younger days to listen to together. Anyone who is turning 75 has loads of memories. There are so many places and people that have been important to them over their life, and they may not have seen these places in years. A trip to see some of those special places is an event that you’ll both enjoy, and a memory that you’ll both cherish. Before you go you might want to take some time to make sure that you have the correct addresses. After all many of the buildings and places will changed over the past 75 years, and the birthday man or woman may not immediately recognize these places. Another great way to celebrate a milestone event is to create a slide show using favorite photos from the person’s lifetime. You might try asking family and friends for their favorite photos so that you get a wider selection. If the photos are not in digital format, then you’ll need to scan them into your computer. You can then use your favorites photo editing software to make a slide show. Don’t forget to add music to create a really unique show! If you need help with this you might try asking a teenager to help you. Most teams can do this quickly without any problem! Surprise him or her when they wake up in the morning with oversized yard decorations letting everyone know that it's their birthday! You should be able to rent yard signs locally...it's become an extremely popular business over the past few years. Looking for a fun and inexpensive gift idea? Put together a birthday candy gram....they'll get a kick out of your creative use of candy. Plus they can always eat the candy later! Anyone born in 1943 probably has fond memories of watching movies at the drive-in. If you can find a drive-in theater near you, load up the car and see what's playing. Does the birthday man or woman have any special trips that they’ve always wanted to take? Taking a once-in-a-lifetime trip is a marvelous way to celebrate the 75th! If possible, bring along as many family members or friends for an extraordinary celebration. A cruise or a resort stay makes it easy to find events for people in all age ranges and activity levels will enjoy. Nothing quite says "Celebrate" like a bottle of champagne. Pop open a special bottle and celebrate in style! Is the senior active on Facebook? If not, you could think about setting up a Facebook account for them. Look up their friends and family members and ask them to send messages for their birthday. You could also try to track down old school friends that they may have lost touch with! He or she will enjoy looking at their friend’s pages and seeing what everyone is up to. 75 definitely isn’t too old for Facebook – my mother-in-law (who is in her 80s and isn’t tech savvy in the least) feels that she has to limit her Facebook time to under 2 hours per day! Your senior probably has fond memories of hanging out at the drug store soda fountain with friends. Malted and milkshakes were the beverages of choice when he or she was a teenager. Try to find a drug store soda fountain...if not, try the milkshakes and malteds at a drive-in such as Sonic. You're never too old to enjoy balloons on your birthday! Fill a room with 75 balloons in their favorite color for a festive surprise. If you have time (and lots of pictures), attach small photos to the dangling ends. See the details here. Rather than give one large gift, think about giving 75 smaller gifts. You could give 75 flowers, pieces of candy, love notes, or stamps. This is an especially fun idea for school-aged grandkids to get involved with. They'll enjoy collecting and counting out the 75 gifts for grandma or grandpa! Find answers to all your burning questions about celebrating a 75th birthday! The official name for a 75th birthday is dodranscentennial (I had to look the proper name up)! "Dodrans" is Roman for three-quarters; centennial is 100 years. Therefore the dodranscentennial is 3/4 of 100 years....or 75 years! What Is the Color for a 75th Birthday? Birthday years do not actually have official or traditional colors. Many people get this confused with anniversaries, which do have traditional colors. The traditional color for a 75th anniversary is diamond white. Birth months, however, do have official colors. So if you really want to be ultra-proper, you could use the colors associated with the celebrant's birth month. However, most people don't know that birth months have traditional colors, so feel free to use whatever color you like! Is 75 a Milestone Birthday? Milestone birthdays are the ones that mark an important birthday year for adults. 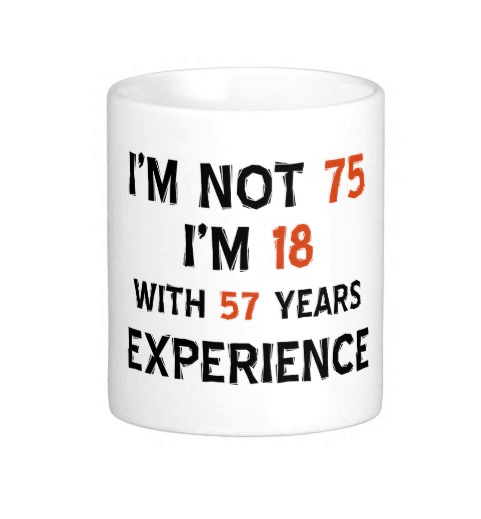 Turning 75, or 3/4 of a century, certainly qualifies as an important occasion! The other milestone birthdays for adults include 21 (legal age in the US), and all of the birthdays that end in "0", such as 30, 40, 50, 60, 70, 80, 90 and 100. Grown-ups frequently stop having birthday parties every year, so their milestone birthdays often are much more elaborate than a regular birthday. What is the Traditional Flower for a 75th Birthday? Birthday years do not actually have official or traditional flowers associated with them. Each birthday month, however, does have a flower associated with it - you can see the list of birth-flowers here. What Is the 75th Birthday Gemstone?